Lock in a great price for Bob Hostel – rated 8.1 by recent guests! The location is the close to all the major attractions. Fort is situated at a walkable distance. The rooms are spacious and interior decor is nice. The owner is warm person. Owner is very good.. We have check out @10am and we had train @4pm and he agree to keep our luggage till the time without any extra cost. This is good with cheap rate. 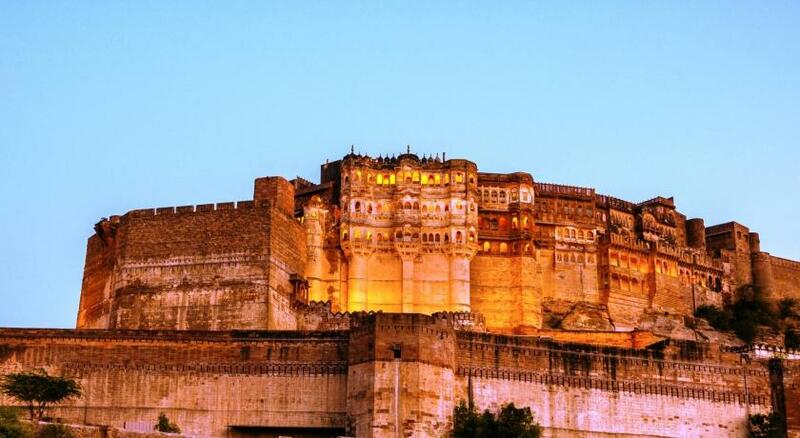 Very affordable guesthouse right in the old town of Jodphur. You pay for what you get so it is not the most luxurious of places but you get a real feel of living in an old town house. Really nice owners and staff and the location is incredible if you want to be right in the middle of everything! Down an hectic alleyway off one of the busiest small lanes of the old city just blocks from the main Sardar Market. Easy to walk to the fort and surrounding markets. The upstairs common area is nice with a good view of the fort. Also, wifi was great! In addition, the AC worked really well, which probably wasn't needed since the fan would be cool enough. Umm as we stayed there for just the night so can't really tell a lot about the hotel,we couldn't even able to explore the hotel as we checked in midnight and checked out early morning and were really tired from driving, i'll say the hotel was different as it had small but cute rooms,thats all i can say. This place was awesome! Great value, the rooftop view was sublime and super comfy to lounge about on. It's walking distance to the clock tower and the fort. Our room was amazing value for the price we paid and it was nice to have our own little private balcony to spend the mornings on. There was constant hot water and wifi was strong. Thanks for a great stay! Nice old style room in the heart of Jodhpur. Hot water, balcony etc. Owner is a cool and helpful guy, rooftop is a cozy place to chill out. The room was great, we had our own bathroom and our own balcony. We really liked the quirky decorations. The rooftop was nice and we met other travelers. I’d stay there again. Rooms are excentrically decorated. Some with hot water bathroom, some without bathroom. Wifi works pretty well on the rooftop. All the rooms i tried had nice ceiling fan, but considering it was cold, i much more appreciated the blankets! Beds were comfortable enough :) Staff was friendly, very accomodating and helpful when we needed something. Food was good :). The roof is a great place to hang out. Location was great. Not far from the clock tower, close to the blue alleys, and walking distance to the fort. Good Location, well decorated and chilling rooftop with restaurant preparing different kinds of food and breakfast! We felt like as part of a big family! Bob Hostel This rating is a reflection of how the property compares to the industry standard when it comes to price, facilities and services available. It's based on a self-evaluation by the property. Use this rating to help choose your stay! Located just 0.7 mi from the famous Gulab Sagar, Bob Hostel offers comfortable accommodations in Jodhpur. Free WiFi access is available. The fan-cooled rooms feature a work desk. Private bathroom also comes with a shower. At Bob Hostel you will find a 24-hour front desk and a terrace. Other facilities offered at the property include entertainment staff, a ticket service and a tour desk. The bed and breakfast is 1.4 mi from Jodhpur Railway Station and Jodhpur Airport is 2.5 mi away. The in-house restaurant serves Indian, Chinese and continental delights. Room service can be requested for in-room dining comforts. This is our guests' favorite part of Jodhpur, according to independent reviews. 뀐 Located in the top-rated area in Jodhpur, this property has an excellent location score of 8.5! When would you like to stay at Bob Hostel? House Rules Bob Hostel takes special requests – add in the next step! Any additional children or adults are charged INR 350 per night for extra beds. Bob Hostel accepts these cards and reserves the right to temporarily hold an amount prior to arrival. Kapil is a great owner and always helped us with everything. He also invited us to his uncle's birthday party on the rooftop and it was a nice experience. One day he also showed me around with his motorbike. So I was able to see places I wouldn't have seen without him. Very nice roof top, clean room and super cool staff and owner Kapil ! Special mention to the trippy lassi ! very friendly and helpful staff - great location - delicious food - very highly recommended! The owners make you feel at home, like your guest and not a customer. Loved hanging upstairs and just chilling out! Due to its location, we heard a lot of noises till midnight, especially the barking of dogs and early morning honking of bike horns. Also the internet/wifi service was not in very responsive mood at the property. I had a room on the street which was noisy at night. It is right in the old town. Be wary of the manager who seemed to want to charge me twice. The boys who run it are lovely, especially Rafik ( Rafi ) Wonderful warm service,best eggs Great roof terrace with view of the fort looming above. A bit noisy at night for puppies in the street, but this is just India! Excellent location, walking distance to main points of interest and also close to train station (18mins walk). Nice room and bed comfortable. Clean. Good hot water and wifi signal. Very nice rooftop with views to the fort and friendly staff! So noisy!!! You can hear people talking in the other rooms but the worst thing were dogs during the night, really annoying. Considering the location, the type of property and the price we paid (cheapest stay of our trip), these guys really deserved thumbs up! The hostel is very nice, clean, blue painted; has a lovely rooftop terrace with amazing view over the city. Our room was clean, with local furniture, private toilet with hot water always available. Wifi was working good; location is cool because close to the main sites but in a small street so not really chaotic. It was my birthday and the staff gave me a present, a gesture that I really appreciated.